Adaptations to aerial vision have been described for the eyes of several species of the genera Periophthalmus, Boleophthalmus, Periophthalmodon and Scartelaos. However, much of this scientific work is quite old and heavily affected by systematic uncertainty (Clayton, 1993). The same names of these genera recall the extreme dorsal position and the great mobility of their eyes. Periophthalmus sp. can move its eyes independently, ranging from a 10-15° stereopsis when frontally placed, through to a complete back to back apposition. 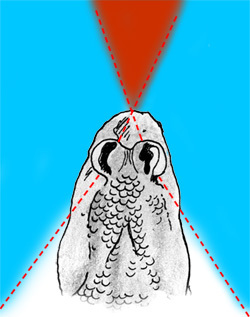 The turreted position of their eyes creates two 180° fields on each side, as well as above and below the fish. Eyes can be raised or depressed by a hammock-like muscular structure, composed of the extraocular muscles obliquus oculi inferior and rectus inferior (Schwab, 2003). This structure allows mudskippers such as Periophthalmus koelreuteri (= P. argentilineatus or P. kalolo) (Karsten, 1923), Periophthalmus sp. (= Periophthalmodon schlosseri) and Boleophthalmus sp. (= Boleophthamus sp. or Scartelaos sp.) (Oliva & Skorepa, 1970a; b, respectively) to quickly displace their visual field without moving their heads, a function accomplished by the neck in most terrestrial tetrapods (Schwab, 2003; Romer & Parsons, 1986). Visual fields in Periophthalmus sp., dorsal view; red dashed lines: limits of each eye's visual field; red: stereoptic visual field. All the species of the genera Periophthalmus, Boleophthalmus, Periophthalmodon, Scartelaos and Zappa (Polgar et al. 2010) present a special dermal cup below the eyes. 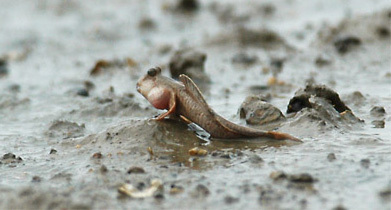 When out of water, dermal cups retain capillary water and mudskippers periodically retract their eyes beneath them to moisten them (blinking). This trait is unique among all living fishes (Karsten, 1923; Munk, 1970; Murdy, 1989). High-resolution aerial vision in Periophthalmus sp. is achieved by means of a slightly flattened lens and a steeply curved cornea (a trait usually found only in terrestrial vertebrates: Schwab, 2003); both are adaptations to the refractive index of light in air, which is smaller than in water (Zander et al., 1999). Periophthalmus sp. is also capable of extreme accommodation to focus on distant objects (Harms, 1929; Graham, 1971; Zander et al., 1999; Kotrschal, 1999; Schwab, 2003). As in other fishes, during accommodation the lens is retracted towards the retina, and it is used for near vision when unaccommodated. The iris has a functional sphincter that seems to have a role both in accommodation (Clayton, 1993; Schwab, 2003) and in adaptation to different light intensities (e.g. in Boleophthalmus pectinirostris: Zhang & He, 1989). 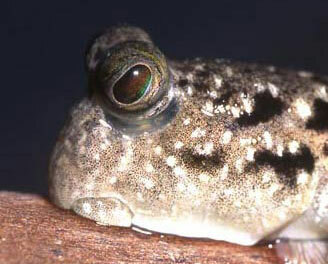 The unaccomodated eyes of Periophthalmus sp. seem to be slightly hypermetropic in air (Clayton, 1993); while it is still debatable whether they are emmetropic in water (Clayton, 1993; Schwab, 2003). The cornea is divided into proximal and distal lamellae (cornea propria and c. conjunctiva, respectively), to provide additional protection to dessiccation and mechanical damage. In some supratidal rockskippers (Blenniidae), such as Alticus kirkii, the cornea propria can be retracted to create an additional eye chamber that can be extended by retracting the lens, and that displaces the focal point to adapt to aquatic or aerial vision (Zander et al., 1999); it is unknown whether a similar function is accomplished by the bilamellar cornea of Periophthalmus spp. Periophthalmus sp. has a ‘ramp’ retina: the distance from the centre of the lens to the retina increases in the vertical direction (Karsten, 1923; Munk, 1970); this contemporaneously allows it to focus on near objects in the dorsal portion of the retina, and distant objects in the ventral one. Higher density of photoreceptors are found in the dorsal part of the retina. In Boleophthalmus sp. and Periophthalmus sp. 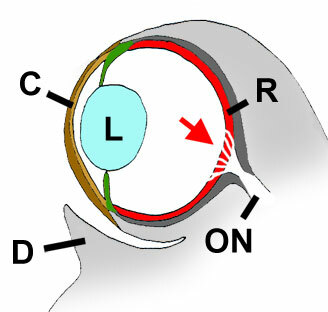 the retina is rich in cones and strongly regionalised: photoreceptors are arranged in horizontal bands dorsally to the fundus (Munk, 1970; Kotrschal, 1999; Schwab, 2003). This would allow a higher resolution and a lower perceptive threshold for movement, especially on the horizontal plane and at right angles to the anatomical axis of the eye, probably increasing the ability to detect small preys (Clayton, 1993). A regionalised retina had also been found in other unrelated gobies and blennies, and seems to be an adaptation to benthic life in small fishes (Kotrschal, 1999). In Periophthalmus sp. the optic nerve fibres do not converge on the optic disc as in other fishes, but are spread out over a larger part of the retinal surface, possibly to avoid reducing the sensitivity of the areae (Munk, 1970). Some species of the genus Periophthalmus present high concentrations of pigments (Graham, 1971) to protect the retina from the intense illumination of the exposed subaerial environment (e.g. on the mudflat). Other species instead present a strongly reflective argentea fibrosa (Karsten, 1923), an adaptation to dark environments (e.g. inside the forest, or at night). The eyes of some species of Periophthalmus living in the high mangrove forest visibly reflect the light of a torch in the darkness, even from within their burrows (Polgar, 2004). Aerial vision could be important also for homing behaviour, and some studies suggest that Periophthalmus sobrinus (= P. argentilineatus) is capable of using the sun to orient (Berti et al., 1992; 1994). Also mechanoreception apparently has an important role. 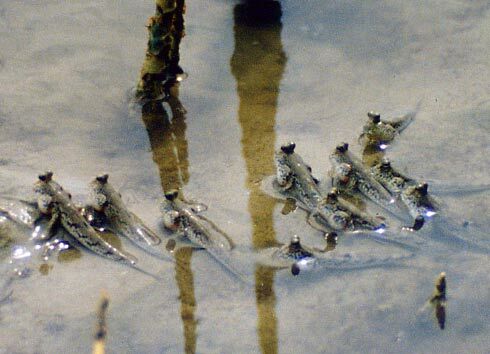 For instance, P. chrysospilos seems to orient by means of a rheotactic response at ebb tide, when it forms coordinated schools of individuals to follow the water edge (Polgar, 2004). SEM image of an isolated neuromast of a goby (Awaous guamensis). It is a cluster of mechanosensory cells with hair-like structures that protrude from the skin surface (cilia), and are surrounded by a gelatinous cupula (not visible in this image). The cupula is secreted by supporting cells. The hair cells are connected with cells of the acoustic nerve. 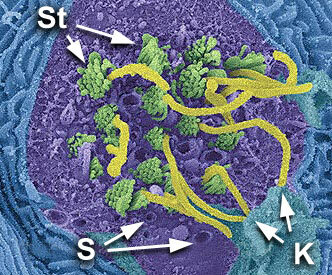 St= Stereocilia (short, non-motile); K= kinocilia (long, motile); S= supporting cells. Not unlike many gobies, oxudercines lack a lateral line system, and completely lack canal-organ systems. They only present isolated neuromasts on the head (pit organs), which in Periophthalmus koelreuteri (= P. barbarus) are deeply embedded in the epithelium and innervated by several cranial nerves; only two "posterior organs" are superficial, being visible as thin relieved lines behind orbits (Afzelius 1956). Elements of mechanical communication s.l. 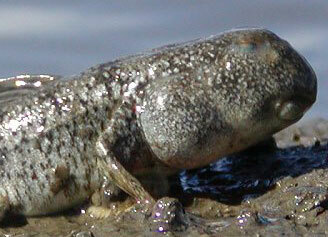 are probably present in Periophthalmus sobrinus (= P. argentilineatus) during agonistic and courting encounters (e.g. Brillet, 1969b; 1970; 1975; 1984a). Examples are: 1) the 'piétinement' - the fish hits the ground with the pectoral fins, producing vibrations that propagate through the wet mud; and 2) the 'ondulation' - the fish waves its tail while standing in place, partially emerged, displacing the water around its body (Brillet, 1975). This latter behaviour has been also observed during the courting sequence of males of P. modestus (Y. Ikebe, Mudskipperworld). The 'piétinement' instead, could be a substitute or vacuum activity triggered by conflict, induced by aggressive encounters (Brillet, 1975). The capability to discern sounds (258-651 Hz) propagated through air has been demonstrated in Periophthalmus koelreuteri (=?) (Diesselhorst, 1938), yet the location of the sound receptor is still unknown. Acoustic communication while out of water was demonstrated in Periophthalmodon septemradiatus during aggressive interactions, a unique case in all non-tetrapod vertebrates (Polgar et al. 2011). The mechanism of sounds' production and transmission is however still unknown (as in other soniferous gobioids).